Enchanting Vietnam can be characterized with the following words: overwhelming nature, an active business population, many temples, a moving history and last but not least its friendly and hospitable people. Have the famous tailors in Hoi An make you a tailor-made jacket or try to cope with the thousands of little scooters in the bubbling capital Hanoi. Colours, smells and flavours all welcome you and will turn this journey into an unforgettable experience! Vietnam is an extraordinary country, offering you an incredible richness in culture and historical attractions, some of which are gathered in the UNESCO World Heritage Program. 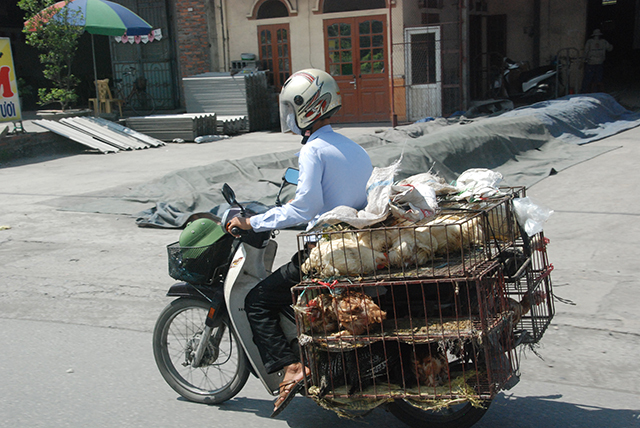 Arriving in Vietnam’s capital Hanoi, you will immediately learn that the Vietnamese don’t have traffic rules. However, there is an abundance of cultural attractions, e.g. the Ho Chi Min Museum and Mausoleum. Hoi An, a charming little town full of Chinese lanterns, harbours many tailor shops offering you a wide array of beautiful garments. Prepare yourself for the unlimited low-budget options to have your own clothes made here. Even your own design can be transferred by these local tailors into one-and-only pieces of clothing, uniquely being manufactured for you! An idyllic swimming, diving and snorkling paradise, Nha Trang is ideally suited to recover from heavy travelling. Its seas are clear and bright and offer a wide diversity of water wildlife. In addition, scooters are offered for rent to enjoy the refreshing breezes along the Nha Trang Coast. From Nha Trang ‘easydrivers’ take you the mountain village of Da Lat. These motor bikers have a long lasting experience taking tourists through the various mountainous regions of Vietnam. They will inform you extensively on the country ’s history and will show you around the many villages usually inaccessible for tourists. 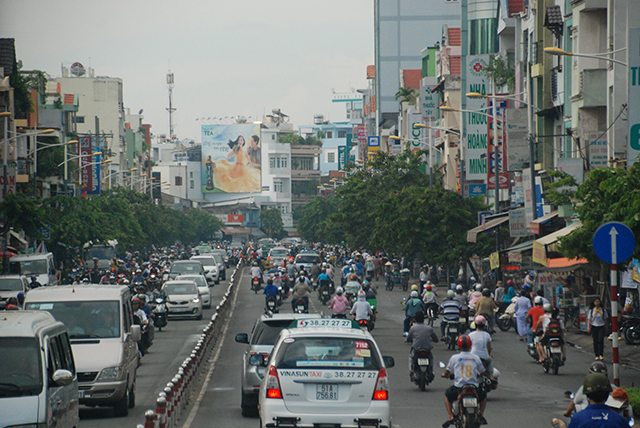 Ho Chi Minh City offers you an abundance of chracteristics from the Vietnamese war. Its War Museum, the impressive Cu Chi tunnels and a boat trip through the Mekong Delta bring back memories from those days. However, nowadays the many attractive and cosy locations showing every day present life will nodoubtly make your stay in the city worth while! The event will be organised with a minimum number of 15 participants. In case the event has to be cancelled, you will be informed not later than 4 weeks before the scheduled departure dates. When the minimum number of participants is registered, you will be informed directly on the exact dates the event will take place, including details regarding the travels involved. You can register for this trip as a group as well as individually. Upon arriving in Hanoi a bus transfer will take you from the international airport to the hotel in Hanoi City. Here the afternoon may bring you the opportunity to either recover from the flight or let you enjoy the first impressions of the city: a visit to the Literature Temple, the Ho Chi Minh Complex, the Museum of Anthropology, a walk along the Hoan-Kiem Lake or participate in the Water Puppet Show. Today you will receive your optionally reserved mountain bike. The first day of the Mountain Bike Challenge: of the 145 km we will cover 80 km by mountain bike, including 40 km off-road! 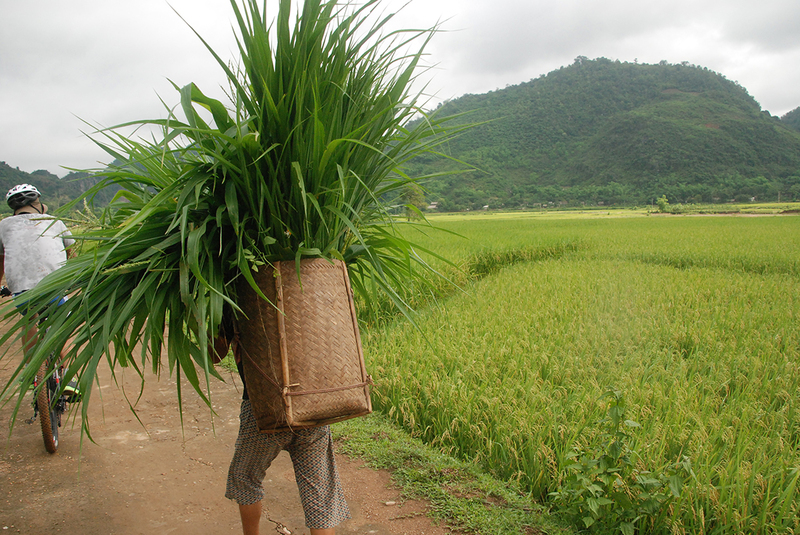 Leaving the hotel in Hanoi quite early, you will enjoy the fantastic Vietnamese country side. 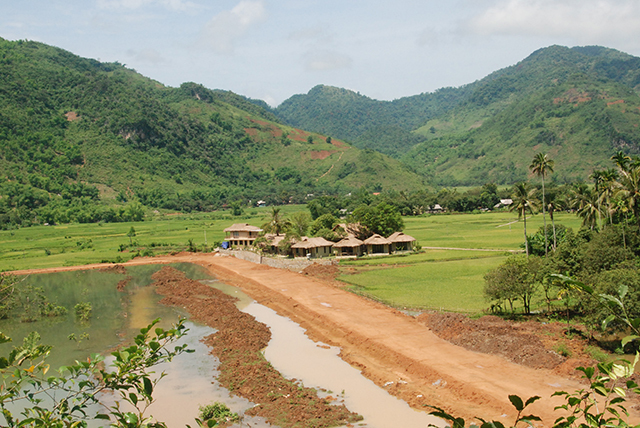 Lunch will take place in a local restuarant, followed by a mountain bike tour along the Hoa Binh Reservoir. You will enjoy the stunning scenery with an emerald green lake to your right and the mountain tops seeming to reach heaven to your left. Looking down at the many rice fields you will feel being connected with the natural environment and traditional culture of the local Thai people of Muong. We will stay overnight in guesthouse in the village of Poom Coom. Our 75 km today’s mountain bike tour (with 30 km off-road) will take us along paved and unpaved roads, including 15 km climbs covering a difference in altitude of 500 m. Highlights on the way encompass a boat trip over the Mo River, mountain biking between several villages and to the Pu Luong Natural Reserve. We stay overnight in a homestay with the local Thai people in Kho Muong, an idyllic village among limestone mountains covered with rice fields: probably one of the most beautiful locations of this trip! 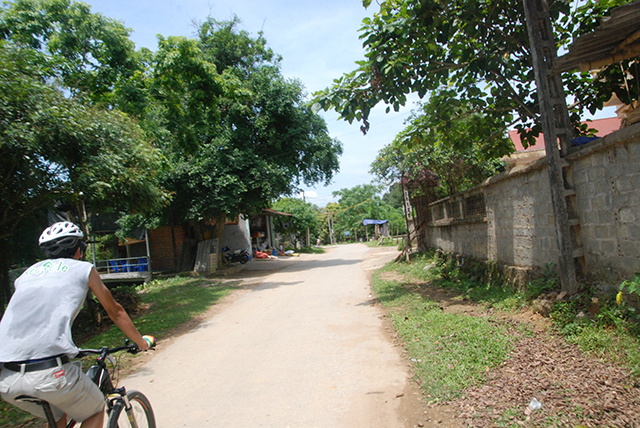 Our today’s 225 km tour brings us 100 km mountain biking, starting along a small road connecting to Cam Thuy. From here a fast stage along smooth asphalt paths along the Ho Chi Minh Highway will take us to Ngoc Lac and additionally to Lam Son and Yen Cac. After lunch our trip will bring us to Do Luong where we arrive late afternoon and will find our tonight’s lodgings in a mini-hotel. After breakfast we start our today’s 116 km mountain biking in the vicinity of Tan Ky, the starting point of the historical Ho Chi Minh Trail. It contains the important wartime cross road for the military supplies during the Vietnamese war, in which it got heavily bombarded by American planes. This challenging mountain bike tour will include several stops to recover from all our physical efforts! Of the 200 km distance we will bridge today, 100 km is covered by mountain bike. 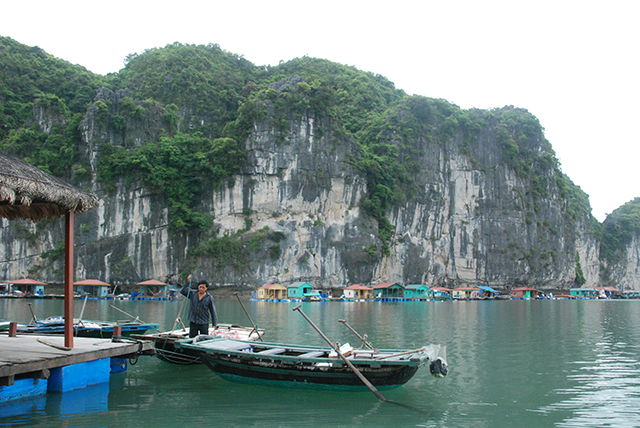 A 1 hour bus transfer takes us up to the Kheve Crossing, leading on to the famous HCM Trail to Highway 12, which connects east and west with the Truong Son mountains. A fast 25 km route to Pheo is followed by 20 km to Da Deo pass, leading us into these Truong Son mountains, where we will enjoy a picknick lunch. The afternoon program will find us mountain biking to Xuon Son and Dong Hoi City, where we stay overnight in a 2-star hotel. Starting with a bus transfer we travel from Dong Hoi to Dakrong, where we will enjoy lunch. The afternoon ’s program will take us by mountain bike to Aluoi. Here our lodgings in a homestay will yield us the opportunity to recover from today’s 100 km mountain biking! Of the 200 km we will cover today, 100 km of mountain biking will take us through beautiful coniferous forests and plantations of Eucalyptus trees that originate from the period immediately after the war. We pass along Truong Son National Cemetery and continue towards Hue. From here a bus transfer will take us to the hotel in Hoi An. Recovering from last day’s mountain biking efforts you will enjoy time-off in the old city of Hoi An. An additional visit to Silk City might offers you the opportunity to meet local people manufacturing Chinese lanterns. An early morning’s bus transfer will bring us along the coast to Quang Ngai, where we will enjoy lunch on the golden sand of the Sa Huynh beaches. In the afternoon we mountain bike along many rice fields and through fishing villages with beautiful views on the sea and the aligning beaches. We cross a long bridge over the Thi Nai Lagoon and will reach the city of Quy Nhon where we stay overnight to recover from today’s 295 km trip, including 80 km of mountain biking. Today’s 225 km trip (including 100 km mountain biking!) takes us from Quy Nhon to Nha Trang through a part of Vietnam ligned with the most picturesque coastline, showing its blue lagoons, idyllic fishing villages and bays full of brightly coloured fishing boats. We will enjoy lunch at Dai Lanh beach and continue to the waterfront of Nha Trang, where we stay overnight. After breakfast our morning mountain bike tour challenges us up the mountain to Dalat, leaving Nha Trang in the direction of the inland . This 30 km flat new road west of Nha Trang brings us to Khan Vinh at the foot of the mountains, where a narrow paved path through tropical forests arrives at the highland: i twill take 50 km climbing towards Hon Giao and 50 km mountain biking over some passes to Dalat. Here we enjoy dinner and stay overnight. The first activity today is a 9 km descent to Dalat. Winding roads through thick coniferous forests gradually lead us to Di Linh. On the way we will encounter many plantations of coffee, thea, bananas and rubber trees planted in the rich red soil, so characteristic for central inland Vietnam and known for its excellent coffees and theas. Next to enjoying lunch a later bus transfer today will cover the last 200 km to Ho Chi Minh City. Today you will enjoy a day-off in Ho Chi Minh City. A bus transfer will take us to Ho Chi Minh International Airport in order to fly back to The Netherlands. N.B. Optional programs our available to extend your stay either before or after the trip offered here. To apply for a visa you need a passport, valid for at least 6 months following departure. All our travels and trips are booked via Eurocult-Lito-Travels in Utrecht, The Netherlands and are covered by official conditions and terms, layed down in the ‘General Conditions and Terms’ for the Dutch Travel Industry.